Scarlets kept alive their Pro14 chances and hopes of Champions Cup qualification for next season with a six-try bonus point win over Zebre. Number eight Uzair Cassiem scored two tries, while Hadleigh Parkes and Johnny McNicholl also crossed. Replacement scrum-half Kieran Hardy produced a sensational solo effort and Ioan Nicholas completed the late spree. Wales full-back Leigh Halfpenny kicked six conversions. Scarlets still also have an outside chance of finishing in the Conference B top three and reaching the Pro14 play-offs. Defeats for Benetton and Edinburgh on Friday kept alive the hopes of qualifying for Europe's top tier next season. Following the Zebre victory, Scarlets need to win their final regular league game against Dragons at Judgement Day at the Principality Stadium on 27 April and hope Benetton or Edinburgh slip up against Zebre and Glasgow respectively. Scarlets remain in fifth place in Conference B, one point behind Edinburgh and two points adrift of Benetton. The play-offs for the Pro14 title involve the top three teams in each conference, who automatically qualify for the 2019-20 Heineken Champions Cup. The teams finishing fourth in the two conferences will have one more chance to qualify for Europe's top flight next season via a play-off match. The Conference A fourth-placed side will be Cardiff Blues or Ospreys. Scarlets made three starting changes with Wyn Evans coming in for fellow Wales prop Rob Evans, who is out for the season after shoulder surgery. Flanker Josh Macleod replaced James Davies, while Nicholas took Steff Evans' place on the wing. Zebre made nine changes to the side who lost to Connacht 6-5 last weekend. Scarlets opened the scoring with a try from South African number eight Cassiem after the home pack shoved their Zebre counterparts off a scrum against the head. Halfpenny converted. The scrum dominance continued with Zebre tight-head Marco Ciccioli yellow-carded. The hosts capitalised on their numerical advantage with Wales centre Parkes crossing for a well-worked try. The home side were indebted to the breakdown turnover work of Macleod who continually forced Zebre to concede penalties but the Scarlets were hampered by a malfunctioning lineout. 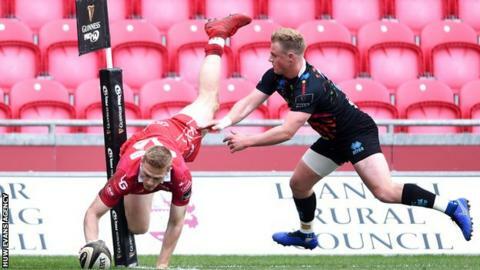 Scarlets managed their third try on the hour as a well-worked move allowed man-of-the-match McNicholl to dive over in the right-hand corner spectacularly. Halfpenny converted from the touchline. Zebre were again down to 14 men again with captain George Biagi yellow-carded for a technical offence at the ruck. Cassiem took advantage as he powered over for his second score and the crucial bonus-point try. The hosts had been helped by the second-half replacement of the half-backs, with Hardy and the recalled Rhys Patchell adding an attacking impetus. Hardy produced a sensational 70-metre run to score, while Nicholas completed the scoring with a breakaway try straight from the restart with three tries in the final six minutes. Hardy was only denied his second try late on because of a forward pass. The final flourish was a fitting end to the last match at Parc y Scarlets for Wayne Pivac, Stephen Jones and Byron Hayward, who are set to link up with Wales after the World Cup in Japan later this year. The trio were presented with mementos after the match along with departing players Will Boyde, David Bulbring, Tom Price and Declan Smith. Scarlets: Leigh Halfpenny; Johnny McNicholl, Jonathan Davies, Hadleigh Parkes, Ioan Nicholas; Dan Jones, Gareth Davies; Wyn Jones, Ken Owens (capt), Samson Lee, Lewis Rawlins, Steve Cummins, Will Boyde, Josh Macleod, Uzair Cassiem. Replacements: Marc Jones, Phil Price, Werner Kruger, Josh Helps, Ed Kennedy, Kieran Hardy, Rhys Patchell, Kieron Fonotia.